Heavy cast iron base, trunnion and arm. Capacity: 4" square, round and shapes. Abrasive blade can also be used. Sealed ball bearings. 5 HP, 3 phase 220 or 440 volt motor (single phase also available). 4400 spindle speed at 3450 RPM. Opens 5" and holds work on both sides. 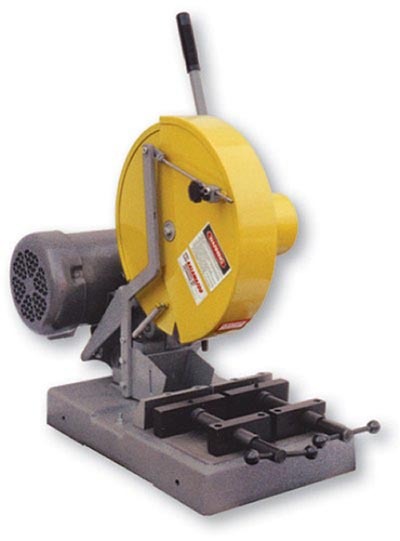 MODEL HS14 14" high-speed "straight-cut" non-ferrous saw. 5 HP, 3 PH 220 or 440 volt. Motor RPM 3450.